This 192 sq. ft. off-grid tiny cabin design was submitted as part of Lamar’s off grid tiny house design contest where you can win up to $500. But this 12′ x 16′ tiny house is designed to be built using 2×6 construction to add extra insulation because the home will be heated with solar power. There will be a ‘soda can’ type solar heater as well as using natural window solar heating by design. It is also set up to receive wind power and collect rainwater. A propane tank can be used just in case solar water heated water is not available and it can also be used for cooking if needed. 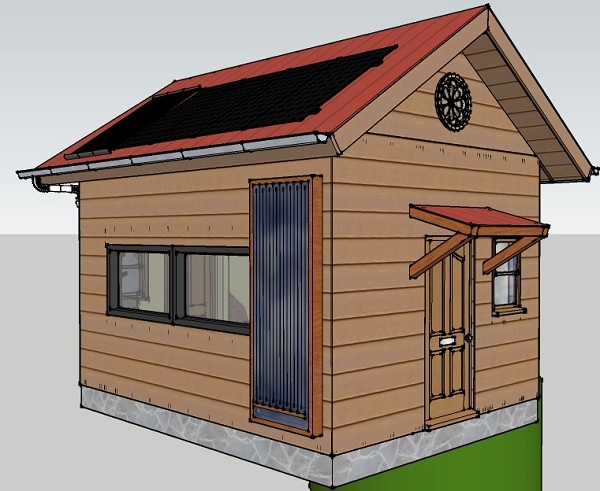 More information on this design and its inspiration is available at the original post on Simple Solar Homesteading. Good idea, BUT you will be using bird poop water. I really like this concept on a small homestead. However, I want to point out that wind generators create a lot of dirty electricity which has been found to be a huge source of such illnesses such as cancer. I’ll just stick with solar. There is an excellent book out called “Dirty Electricity,” by Dr. Samuel Milham. It can be purchased at Amazon. If you don’t know anything about dirty electricity, this is an eye-opener. Dr. Milham is an epidemiologist. Cathy-Ann, please stop spread such nonsense about wind generators. They make no more than the computer you wrote this on, in fact far , far less. Nor is even that a problem as proven in so many studies. The man is a quack making money off gullible people and you are helping him hurt people by promoting things you don’t remotely understand. I understand it very well working with electricity for 50 yrs and it’s good, bad points. But unless you give up ALL electricity and live somewhere lightning doesn’t happen, you can’t get away from it. Nor should you. Just why would you think WT causes it and solar doesn’t if it was true? Do you use anything with an electric motor or transformer in it? Guess what? The reasons for more cancer is we live long enough to get it now plus various new chemicals, etc. Also like the coal powerplants emit that would have to be used to make up for no WT’s in the US. Which would make the same kind of power, only actually dirty, cancerous killing from the exhaust. It’s our biggest threat by far. Using recent numbers switching from WTs to coal which is what will happen would kill 1,000 people and hospitalize 10,000/yr US. So this scam kills, causes actual cancer this way. Try not to live life in fear. Learn more so you can tell such scams where they can put them. Nice cabin in many ways. I’d arrange the insides differently but that is my taste. 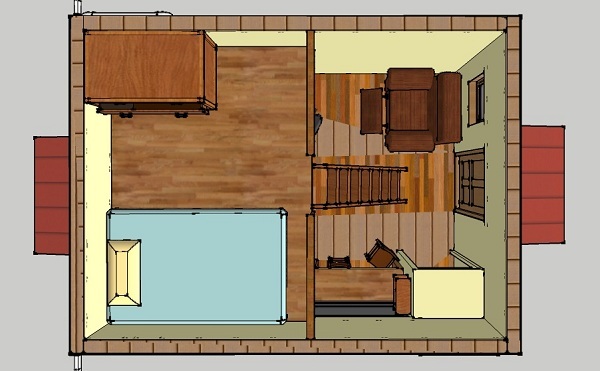 I’d make it livable for 2, not just 1 person with more seating, less kitchen, bath. In TH’s this size makes living offgrid fairly low cost as demand is less and will be the future I believe of most homes, buildings making their own power. I like the water system. As for the bird comment I’d hope everyone filters it coming in and treats it in tank before drinking. Also most dump the first rain letting it clean the roof before storing cleaner runoff afterward. To tell the truth, I’m curious about the “Homestead” lay out and the structure next to the car. AND how large is that barn? What’s it used for? Grain? Machines and tools? I note the two ‘fields’ and the chickens in the center. The wind turbine, cool! Then there’s that structure behind the barn. Is that a greenhouse? Does this guy actually have this or is it his game plan? How do it provide water to tiny cabine house? I can’t see any water tank, water reservatory or water supplies in the images. If you don’t have water for 2-3 weeks how do you solve this problem?